How to open a presentation document in Keynote on iOS? In Keynote app on my iPad, I see a list of seven of my presentations “On My iPad”. Next to these is a list of “Locations” including iCloud Drive, On My iPad, and Recently Deleted. When I single-tap on the icons, nothing happens. When I double-tap on the icons, nothing happens. If I press-and-hold I get a context menu offering items such as Copy, Duplicate, Delete, and so on. But no Open. ➥ How does one convince Keynote to open its own presentation files? Crashed out of Keynote. Relaunched Keynote. Now a single-tap opens the presentation. Not the answer you're looking for? Browse other questions tagged ios ipad keynote . How to change secondary/fallback language on iOS 8? How do you stop a looping Keynote presentation on iPad? Keynote: How to skip “open presentation” window? 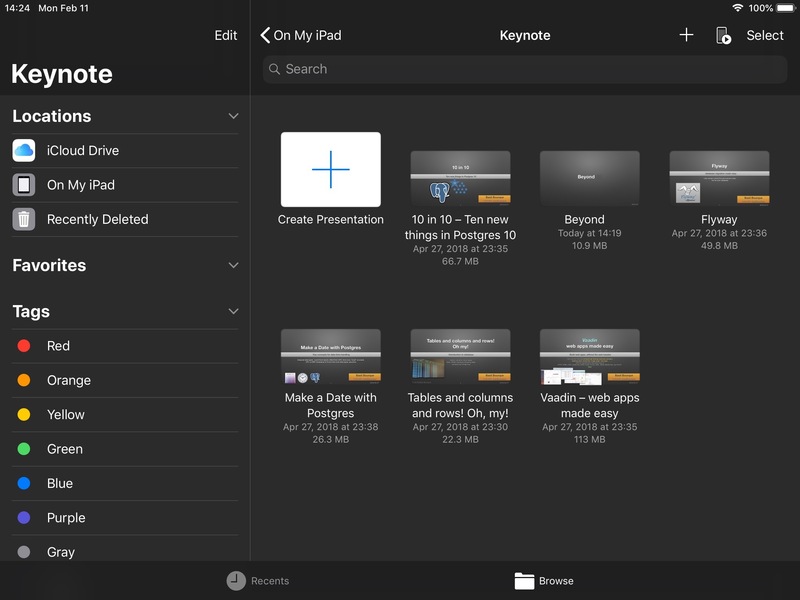 Can 'Presentation Notes' in Keynote be Locked?